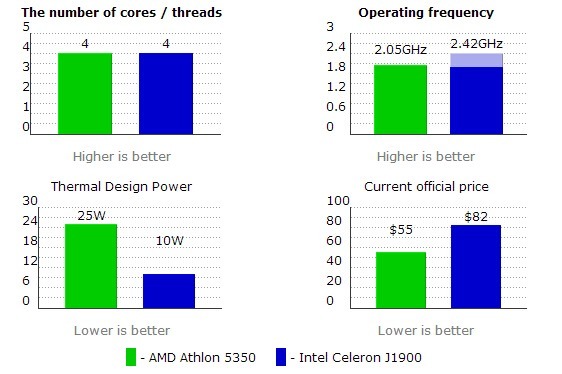 Base frequency of the Athlon 5350 is higher than the frequency of the Celeron J1900 microprocessor. This processor has Advanced Encryption Standard extension to the instruction set enabled. These instructions provide hardware acceleration of AES encryption and decryption, and are beneficial if you need to secure your disk or network data. The Athlon 5350 incorporates AVX and F16C instructions, that were introduced in the recent past. These extensions are not extensively used in programs yet, but their support should improve in future applications. The CPU is priced 33% lower. The AMD 5350 uses Socket AM1. The processor can be removed from the socket without effort for replacement or upgrade. The Intel J1900 is 60% more energy efficient. The charts below compare the most important Celeron J1900 and Athlon 5350 characteristics. These features, as well as an IPC (instructions per cycle) number, determine how well a processor performs. The “Operating frequency” chart uses dark color to represent base frequency, while lighter area is for additional frequency, provided by Turbo feature.